It was HighWood's criteria to create a no-compromise, yet cost-effective bass drum pedal. The result is a quality product, representing Brit engineering at its very best - mission accomplished. Incredibly robust build. Smooth, accurate action. Very versatile adjustment options. 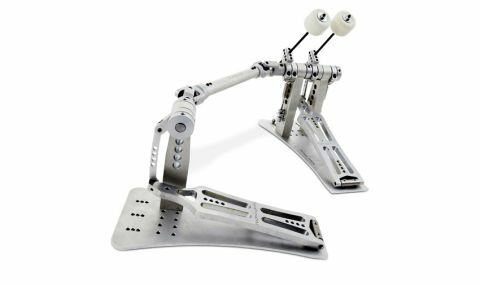 HighWood claims that The Malleus is "the last pedal you will ever need". It might be right. Yorkshire-based company HighWood has built up a richly deserved reputation for making quality hand-crafted drums at sensible prices. Though it manufactures many of its own hardware components, creating a whole new kick pedal from scratch, would seem like a mission impossible. HighWood's Gareth Heeley jests that it's a change from his usual "wood bending" - he would never have imagined four years ago he would actually be engineering bass drum pedals! HighWood claims that The Malleus is "the last pedal you will ever need". So, with a wide and varied choice of seemingly similar direct-linkage models available from Pearl, Bullet and Kitch, Axis, Trick and Polish company Czarcie Koptyo, what makes the Malleus stand out from the crowd? "The Malleus doesn't come loaded with flashy gimmicks, but it's the most robust looking pedal we have ever seen"
The Malleus (meaning Hammer), doesn't come loaded with flashy gimmicks - in fact it is rather understated. It is, however, the most robust looking pedal we have ever seen. It has truly muscular proportions. The drive shaft wouldn't look out of place on a small car and the solid aluminium bearing posts seem fit to pitch their own against an army of feet, let alone just two. The 10mm thick footplates (even with their cut-outs), appear tough enough to take the stomps from the heaviest pair of size 12s. Each Malleus pedal is made from quality materials including stainless steel, high-tensile steel and high-grade aluminium. Gareth Heeley shuns the use of die-cast and white-metal components, which he says would compromise the functionality and longevity of the pedal. Every component has been precision-machined using the latest CNC Lathes and Mills and all moving parts are fitted with bearings, making it both resilient and as smooth as possible. Highwood has included a selection of four Allen keys to set the pedal up and make any fine adjustments. These include beater positions, beater angle, lateral pedal positioning, beater/pedal distance from the drum and much, much more. One of the questions we posed to Gareth was the use of Allen-type screws, rather than the more convenient square-headed tuning bolts. He says "the pedals have 'dog point' screws made from high-tensile steel that, once in place, 'bite' without the need for locking washers etc". Any adjustment is likely to be during the initial stages of ownership - once set up, it should never need changing. One of the most unique features (credited to HighWood's machinist), is the bass drum clamp which pivots on a round peg like a tow-ball. The 'C' clamp attaches to the bass drum and the tow-ball peg (located on the actual pedal), slots into the clamp. With the Malleus' modular design and construction, everything is bolted onto the footplate. This means it can be easily converted for a left-handed player or used as two entirely individual single pedals. As with most kick pedals, there is a degree of user-adjustment necessary when using it for the first time. With the Malleus, the first thing to do is attach the 'C' shaped 'tow-hitch' clamp onto the bass drum hoop. This is centred in position in between the lower tension rods and securely tightened by the single Allen bolt. The foot of this bolt has a plastic tip, which together with the rubber insert within the clamp, helps avoid damaging our precious maple hoop. "Considering its robustness, the Malleus remains silky smooth and responds with formidable and fearsome accuracy"
Once the clamp is attached, the next time the pedal is used, it's simply a matter of lowering the drum onto the 'tow ball' - and it's attached! Now, it's not that we don't trust this unique system but, to begin with, there are one or two tentative strikes watching if the drum and pedals stay put. Once our confidence builds, dishing out a few good wallops confirms this is simply not going to budge. After only minor tweaks of beater throw, spring tension and pedal distance from the drum head, the increase in performance is immense. Even making the most subtle changes, it becomes clear that adjustment potential is virtually infinite and will make tailoring the Malleus to any style of player a breeze. With the beaters sited equidistant within the drum hoop, a flurry of brisk strikes flows smoothly and seamlessly. Whichever technique or foot motion is used, the pedal follows closely and faithfully. Considering its robustness, the Malleus remains silky smooth and responds with formidable and fearsome accuracy. From the most delicate flick of the toes, the heaviest heel or good blast from the balls of your feet, it's immediate and positive - which is awesome.